Artificial muscles grown from human stem cells could pave the way forward for treating muscle diseases, according to new research led by UCL. 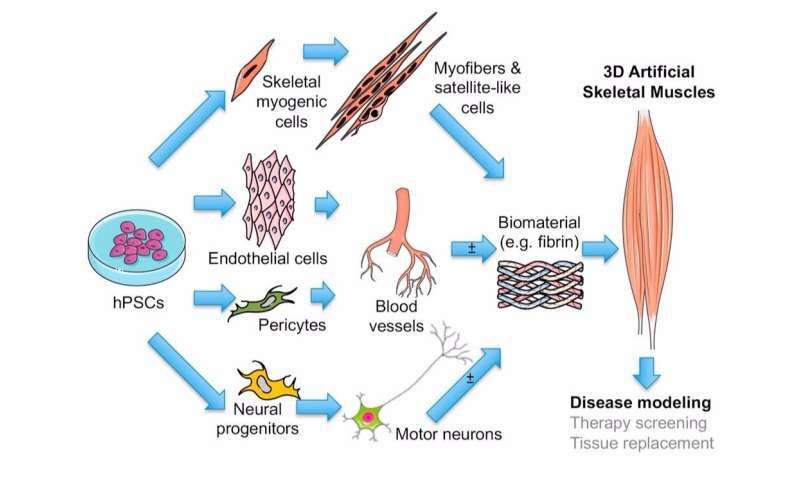 The study, published in Cell Reports, found that 3-D artificial muscles can be generated from both healthy and diseased stem cells of patients with different types of severe muscle disorders called muscular dystrophies. Importantly, the artificial muscles accurately model severe genetic muscle diseases, which will allow scientists to test different types of therapies on human cells that embody the characteristics of the patients. This discovery is expected to lead to more personalised treatment options. "Our work shows that we can make patient-specific mini-muscles in the lab and those artificial muscles show distinctive features of some forms of severe muscle diseases. Notably, the stem cell technology utilised to produce those muscle allows us to generate a virtually unlimited number of muscles in the lab and to have them combined with other cell types of the same patients which are very difficult to obtain otherwise, such as motor neurons" said Dr. Francesco Saverio Tedesco (UCL Biosciences). The artificial muscles were grown from human cells from patients with different forms of muscular dystrophy, including Duchenne, limb-girdle, and congenital muscular dystrophies. Patients' skin cells were turned into human induced pluripotent stem cells, which have the advantage of being grown indefinitely in the laboratory and then induced to generate not only muscle cells, but also other important cells present in muscle such as blood vessel cells and motor neuron cells. "Our findings are expected to facilitate development of therapies for incurable forms of muscular dystrophy by providing a novel way to test treatments in a personalised fashion and on multiple cell types at the same time. They could also help in developing artificial muscles for tissue replacement," added Dr. Tedesco. The work follows another recent study published in Nature Communications showing that artificial muscles can be grown from human pluripotent stem cells. The current study builds on that knowledge and shows that artificial muscles grown from pluripotent stem cells of patients with muscular dystrophy can model those severe disorders and can be made to contain up to four distinct cell types from the very same donor.